Being an east-side girl and confirmed homebody, I don't often venture up north or west that often. (And indeed, see my recent "East Side Cafes" for proof of my love for the east side). 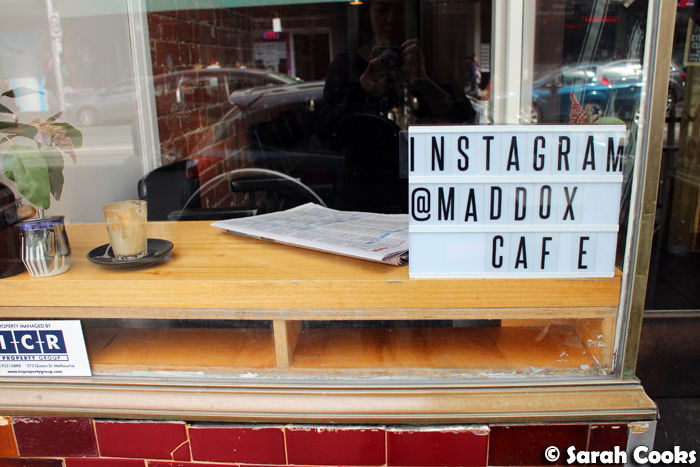 However, when I received an invitation to try out Maddox Cafe, on Sydney road in Brunswick, I had a quick look at the menu online and swiftly decided that it would definitely be worth the drive across town. 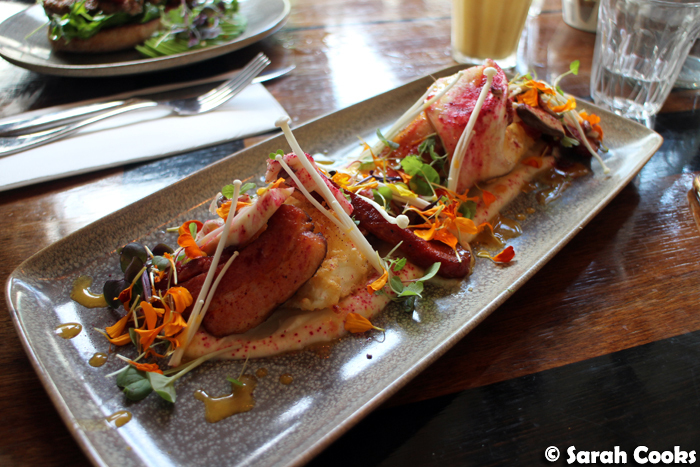 I'm really glad that we ended up visiting, because it turned out to be one of the best brunches we'd had in ages! 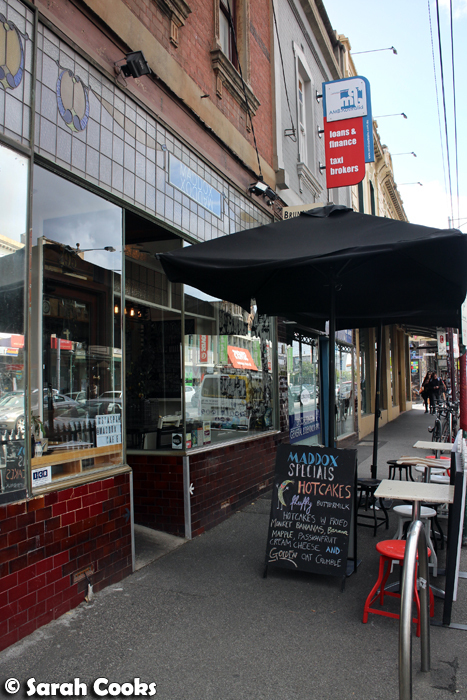 Maddox Cafe is a small cafe located on a busy stretch of Sydney road. Even though it is quite cosy, with its high ceilings and exposed brick walls, the space manages to be bright and airy all at the same time. 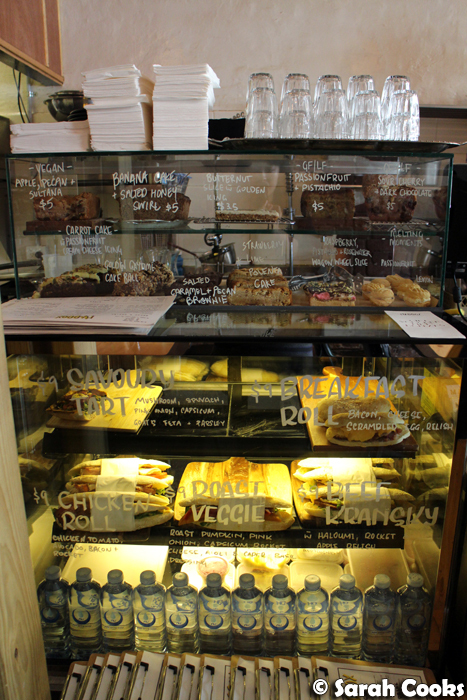 The cabinet offers a range of baked goods, tarts and rolls. However, I think you'll get a more interesting meal by ordering from the menu - think options like black rice bircher, a Moroccan breakfast salad and a rotating special of pretty-as-an-Instagram hotcake stacks with different toppings. Vegetarian, vegan and gluten free options are all clearly marked (obviously that's not a huge concern for me, but I thought some of y'all might be interested! ), and some of the dishes have a default vegan or vegetarian substitution listed to make it easier. We started with a couple of drinks - a very good magic for myself, and a Tropicana smoothie for Sandra. 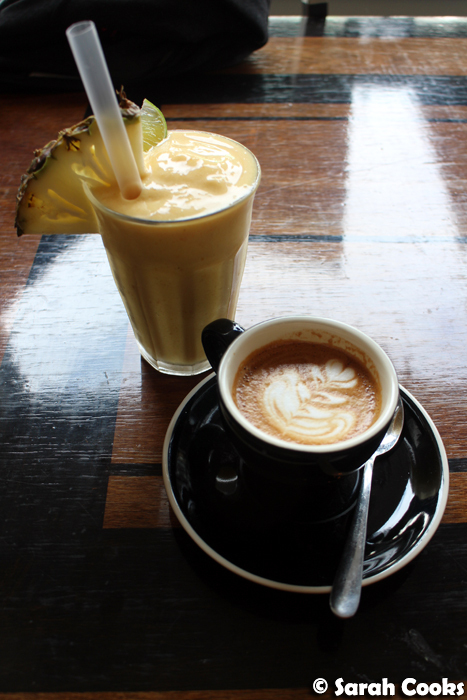 The smoothie was impressive, both fruity and creamy, without a hint of iciness. With the combo of mango, passionfruit, pineapple, lime and rich coconut milk, I thought it was a bit like a non-alcoholic piña colada. Sandra ordered the Manwich - a toasted Turkish bun filled with a spiced pork patty and thick slabs of Kaiserfleisch bacon. It was so tasty! 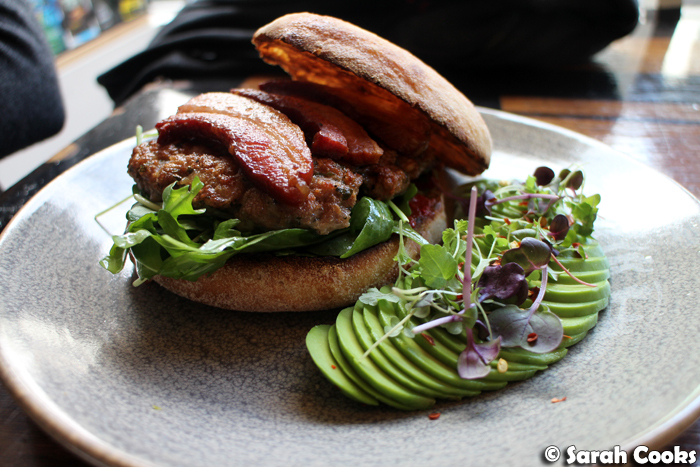 I thought that the use of a spiced pork patty (like a sausage filling, basically) made much more interesting than the usual wagyu burger that you get in most cafes around town. Sandra requested to have it without aioli, and to have the avocado on the side, and it came all prettily sliced and decorated. (You know how I feel about sliced avocado! Positively). Although, come to think of it, the sandwich was already pretty big - I wonder if it would be difficult to eat with the sliced avocado in the sandwich. Perhaps you'd need giant man hands to be able to eat it comfortably. Either way, delicious, would recommend. I posted a picture of the Manwich on Instagram, and a colleague of mine commented: "Looks delicious, and I hope they have a "womanwich" too that is equally tasty". Well, they didn't quite have a womanwich, but they did have a lady dish that was equally awesome, the Boss Lady's Breakfast! I ordered this because, duh, I'm a total boss. Also, panko-crumbed eggs and sriracha bacon. Reading the description, I did wonder if there might be too many competing flavours on the plate, but they came together really well. The pickled mushrooms and beetroot dust were quite sour, but this was balanced out by the creamy cauliflower skordalia. Of course, eggs and bacon are a perfect match (eggs need salt; bacon is salty deliciousness), and the spicy sriracha glaze gave the salty-sweet bacon another layer of flavour. 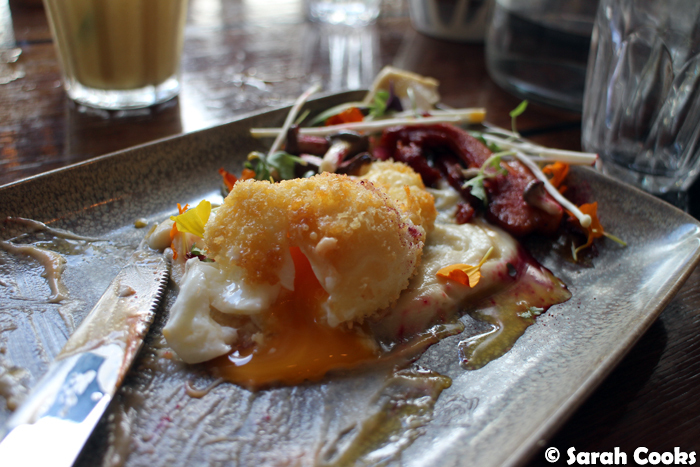 The eggs were perfectly done, with a crisp crumbed exterior and flowy melty yolks. Winner! At the time of my visit, the Boss Lady's Breakfast was a special. Looking at Maddox's Instagram, they do a rotating selection of egg-based specials, so if you visit and the Boss Lady's Breakfast isn't on the menu, you'd probably be able to get something quite similar! 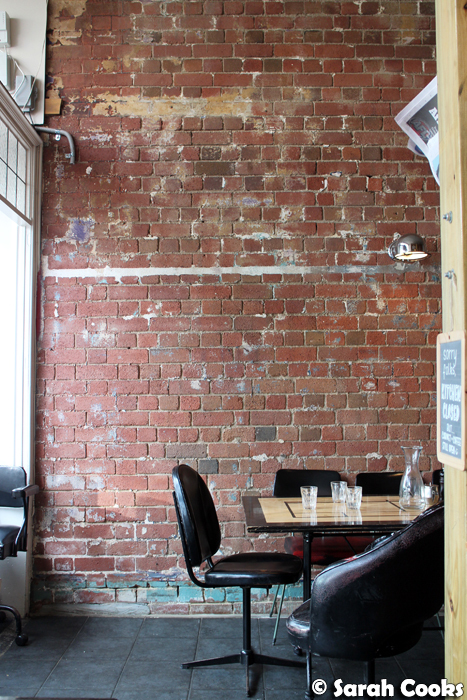 Maddox Cafe was a really nice spot for a relaxed weekend brunch. Good drinks, great food, chilled vibe. Thanks to the team for the invite! Sarah and Sandra dined as guests of Maddox Cafe. lol at the naming of the Boss Lady dish. It does seem like a lot of different flavours on the one dish but I do love the sound of panko crumbed soft boiled eggs! Perfect runny egg yolk too. Everything is looking good! Your post makes me hungry. I love the tropicana smoothie and the manwich!